At Jackson Park Hospital one of the most common questions students ask is where to go. If it’s your first time then you will obviously will not know where to go unless you did AICM. However, if you are from MUA, SGU, Avalon, Xavier University or any other medical school other than SJSM, you will not know where AICM room is. The places to go in Jackson Park Hospital for clinical clerkship depends on if you are doing core rotations or elective rotations. If you are doing core rotations then you go Leon Gholston or Lorraine McCrary; their offices are in the same hallway as the AICM classes, which are located in the building across the ambulance parking bay. The ambulance parking bay is in the emergency area, and it’s located between the Family Medicine building and the hospital. The red circle is pointed toward an entry way between the two buildings. You will see students going in and out from there for core rotations and AICM classes. If you are doing electives there then you go to Rosemary Brown or Cornelius Ford or other officers in their unit, which is located in the corner of the hospital which faces diagonally to BP across the street. 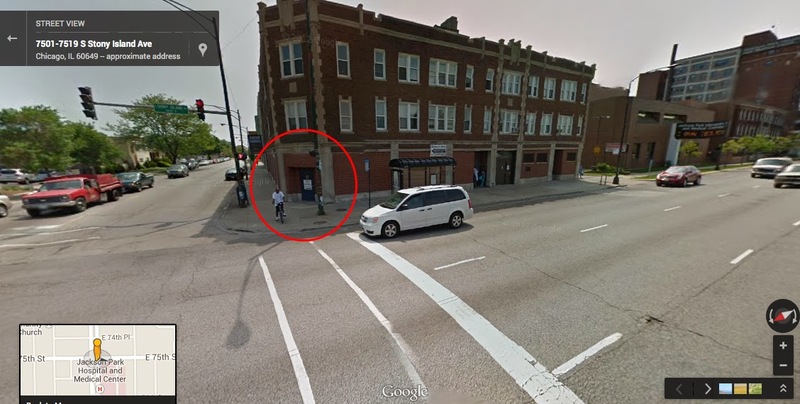 The red circle is pointed towards a door that is diagonally facing BP gas station. This is where you go to for elective rotations.